These words have resonated with me ever since I first read them, for they serve as the perfect way to characterize those boxers who lack any one outstanding attribute yet are still capable of achieving success in the ring. For me, those are the fighters who are most compelling. It always intrigues me to watch fighters who rely upon their intangibles like grit, guile, and ring generalship to win fights; and it always captures my attention when these types of boxers are pitted against those who are talented enough to be considered “a hell of a fighter”. That’s why tonight’s Showtime triple-header appeals to me, because it features at least one instance where a really good boxer is matched against someone who seems poised to reach a higher level. Plus, the whole card features no less than six of the top ten fighters in the 154lb division in action in fights that will help to determine which of them ultimately reigns supreme at the weight. That’s an added bonus. So, having established the reasons to watch this card, let’s take a closer look at bouts that are scheduled to take place. The fight that interests me most features the undefeated IBF titleholder, Jermall “Hitman” Charlo (23-0, 18 KO’s) defending his belt for the second time against former WBA kingpin Austin “No Doubt” Trout (30-2, 17 KO’s). As the nickname suggests, Charlo is a legitimate power puncher, capable of hurting opponents with either hand and of stringing them together into extended, impressive combinations. He works well behind a stiff, accurate jab and has managed to avoid most of his opponent’s efforts to retaliate without too much difficulty. He does a lot of things well, and has the look of being someone who much just be a hell of a fighter. The only reason why I’m hesitant to accord him that status is simple- he really hasn’t faced a really good opponent at any point in his career. Everyone he’s faced so far has been over-matched, and that includes the man he defeated for the world title, Cornelius “K9” Bundrage. So, it’s difficult to know for certain just how good Charlo really is. That’s where Austin Trout comes in. Trout isn’t the hardest puncher in the division, or the fastest of junior middleweights, either. He’s not impossible to reach; and while he’s not china-chinned by any means, he’s been forced to make several visits to the canvas throughout the course of his career. That said, he’s proved himself capable of throwing with enough conviction to stop fighters like Miguel Cotto and Canelo Alvarez in their tracks. While he isn’t the most fleet footed fighter around, Trout does move well and make a point of using angles to keep his foes off balance. And, while his hand speed might not be blazing, he’s still capable of putting his punches together well in combinations to the body and head, and he never seems content to throw a single shot at a time. He recovers well when he gets tagged, and usually doesn’t put himself in a position to get hit clean all that often. In short, Austin Trout is a bit like Billy Graham in that he’s a really good fighter, and it usually requires a hell of an effort to defeat him. Charlo might well have that effort in him, and I make him the favourite to win simply because his punches are more likely to have an affect upon his opponent than vice versa. I suspect Charlo’s edge in height, reach and power will allow him to bank enough rounds to allow him to walk away with a clear decision, but I don’t believe for one split second that he’ll have an easy time with Trout. If he does, I suspect that it will have more to do with Charlo’s ability than with any deficiencies in Trout’s game. Either way, it’s the fight that I consider to be most compelling, though certainly not the only fight of interest on the card. In the nominal main event, “The American Dream” Erislandy Lara (22-2-2, 13KO’s) defends his WBA Super World strap against Vanes Martirosyan (36-2, 21KO’s). Lara, of course, is a technically sound southpaw who likes to circle gracefully around his opponent and draw them into the well-timed, uncannily accurate straight left counter that serves as his best weapon. Blessed with great hand-speed and an often brilliant sense of defensive awareness, the Cuban expatriate certainly can be a hell of a boxer- when so inclined. The problem is, this inclination tends to vary dramatically from one fight to another-sometimes even from round to round. There have been points, most notably against Canelo Alvarez, when the Cuban has become passive and predictable, as though hypnotized by his talent and by the tempo he chooses to set during his matches. The challenger isn’t nearly as gifted, and never really has seemed capable of separating himself from any of the contenders he has faced during the course of his career. But, the Armenian born former U.S. Olympian is a solid fighter who can operate reasonably well at range and in close quarters; and he’s had a way of remaining competitive with the higher quality opponents that he’s faced thus far. The prime example of this would be his first bout against Lara when the two met back in November 2012. On that evening, Martirosyan was able to use his aggression and awkwardness to offset his opponent’s edge in speed and skill; and was able to secure a technical draw after nine messy, foul-filled rounds. Granted, Lara was able to outland his opponent and many who sat through the entire affair were of the opinion that he should have been awarded the decision. Still, he didn’t look terribly impressive that evening, and Martirosyan should receive at least partial credit for that. Three and half years later, they’ll meet again; and I’m certain that many boxing fans fear that these two will once again produce the same type of contest that occurred back then. That would certainly benefit the challenger, and I have little doubt that he’ll do everything possible to ensure a replay of the first fight. However, I think Lara won’t be quite as willing to allow this to happen, and will be more inclined to fight more consistently at his desired range. If he’s successful, the “American Dream’ will almost certainly secure the victory, and will likely do so in a fashion that will make him appear to be a hell of a boxer. And, even if that doesn’t happen, I suspect that Lara will still find a way to out-land Vanes by a significant margin once again; and land enough clean punches to capture the eyes of the judges at ringside. Regardless of the kind of fight we witness, I suspect that Lara will emerge as the victor. I can only hope that the fight we watch this time is a little bit different-and a whole lot better- than the one that took place the first time around. Finally, I’d be remiss if I failed to mention Jermall Charlo’s twin brother, Jermell (27-0, 12 KO’s) who is slated to face the son of the legendary Julian Jackson for the vacant WBC World 154lb belt. Jermell isn’t nearly the puncher that his brother is, and I personally don’t get the impression that he’s ever going to reach the point where I would ever consider him to be a hell of a fighter. But “The Iron Man” is a very good, technically sound, quick-fisted boxer who probably isn’t going to be an easy out for anyone he meets inside the ring. He appears to have a significant edge in terms of skill and speed over tonight’s opponent, and as long as he can avoid getting tagged with anything big, he should probably emerge with the victory. That said, John Jackson (20-2, 15KO’s) has inherited at least some of his father’s vaunted punching power, and isn’t completely devoid of technical ability. To paraphrase Liebling, he’s probably about as good a puncher as one can be without being a hell of a puncher- and a puncher of that quality is good enough to have moments against anyone. I suspect that he’ll be able to enjoy a few moments of success against Charlo, and while I think Jermell should be able to weather them and walk way with the win, I wouldn’t be completely shocked if Jackson proved capable of springing the upset. The card that’s scheduled to take place at the Cosmopolitan in Las Vegas appears to be one worth watching, and, with luck, it might produce a trio of competitive and entertaining fights. But even if it doesn’t, it provides us with the chance to see some really good fighters in action, and if at least one of them turns in a hell of performance, I won’t complain at all. 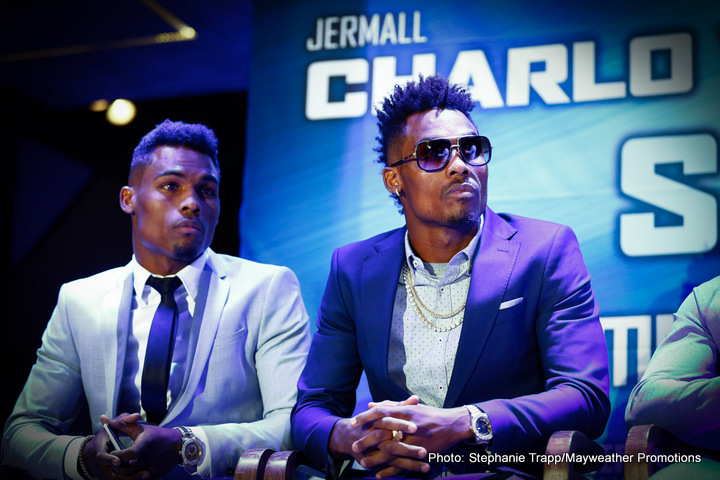 Author’s Picks: Jermell Charlo UD, Jermall Charlo UD, Erislandy Lara UD.